A very charming set of three kitchen towels in a very fine ecru linen made especially for drying fine crystal. 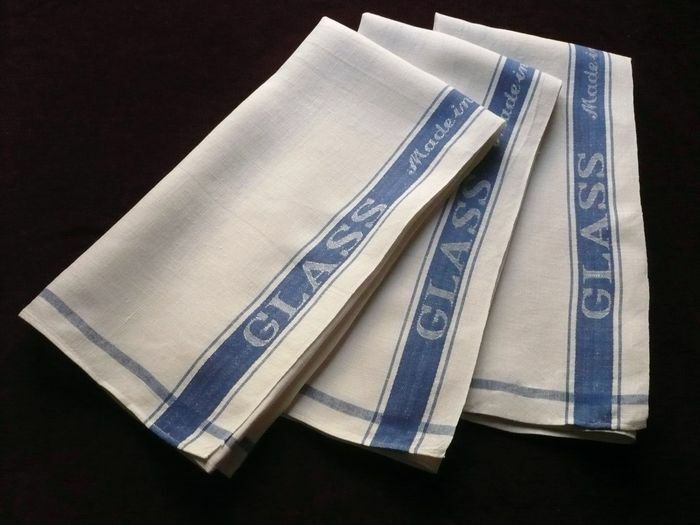 These towels have a blue stripe down either side in which the words, "Glass Cloth" and "Made in Ireland," appear in the damask. This set likely dates from the 30's or 40's and, although washed to freshen it up, was purchased in new condition with its original tags which noted that these towels were made to order in Ireland for Bloomingdales, NY. Impeccable as-new condition. Dimensions: 29.5 x 22.5in.